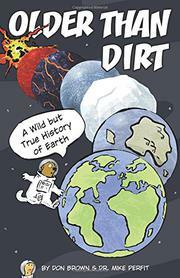 A groundhog and her worm sidekick offer a concise tour of the Earth’s history from the Big Bang to climate change with a glimpse of the bleak, sun-dried future to come—all lightened by frequent humorous asides. Born of the partnership between geology professor Perfit (Univ. of Florida) and prolific graphic novelist Brown, this highly engaging overview briefly introduces a broad range of scientific topics in a vivid and accessible way, for example describing magma as “rock that is so hot that it’s gooey, like chocolate fudge.” Clear illustrations effectively complement the text, rendering the array of subjects memorable and easy to grasp: a cross section of an apple indicates the relative thinness of the Earth’s basalt crust, while a plaid blanket hovering above the planet illustrates the effect on temperatures of excessive carbon dioxide. The groundhog is utterly endearing, and the worm is remarkably expressive considering the absence of limbs and most facial features. Readers will be entertained, informed, and inspired to learn more about whatever piques their curiosity, whether it is uranium, continental drift, glaciers, or one of the featured scientists, such as Marie Tharp. A lengthy bibliography and detailed source notes are an added bonus.